Step away from the glaze packet and try our Balsamic-Maple Glazed Ham! 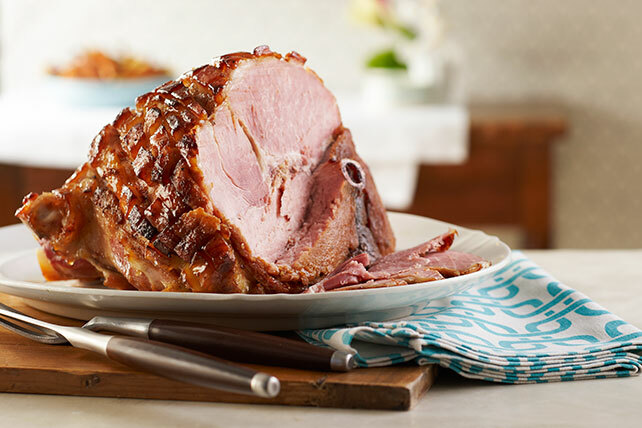 This sweet and salty maple glazed ham is perfect for Easter and other holidays. Remove foil. Brush ham with 1/3 of the glaze. Bake, uncovered, 1 hour or until heated through (140ºF), brushing with remaining glaze every 20 min. Meanwhile, toss parsnips and carrots with oil in large shallow pan. Add to oven with ham the last 45 min. of the ham baking time, turning vegetables every time ham is brushed with glaze. Using a sharp knife, make 1/4-inch-deep parallel cuts, about 1 inch apart, in top surface of ham. Make additional scores at right angles to form diamond shapes. After carving the ham, reserve the bone for making green pea or another favorite soup.